You need more than you think. Always buy more rat traps than you think you need, and make sure they are rat traps, not mouse traps. Even if you have only seen a couple of rats, that could be a sign of a bigger infestation. There could be a whole colony of rats hiding in your walls, so it’s better to be safe than sorry. Follow the rats. 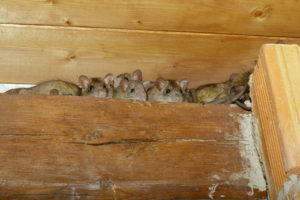 These rodents are most likely to nest in attics, basements, crawl spaces, and especially dark corners. It is important to place your traps where the rats will be most likely to nest, and to hide the traps well. Make sure your traps are spaced out well -15 to 20 feet apart- and place them along walls, as rats like to scurry along them. Beware of Droppings. If you find urine or rat feces throughout your house, do not try to clean it up. It sounds backwards, but rats carry many diseases and spread them through their waste. The same goes for if you find a rat carcass. You should call Critter Control of Miami® immediately to quickly and safely remove the rats. If you have a rat infestation, it can be dangerous for not only your home, but your loved ones too. As soon as you see signs of rats in your home, it is important that you seek help as soon as possible. At Critter Control of Miami®, our experts work hard to quickly and safely remove all the rats from your home, and we even offer free home consultations. If you have questions about rat removal, or different ways to trap rats, call us at 305-258-3587 today.